Classical Limestone is one of our hardest and least porous natural limestones. Tiles are hand cut to remove the square-ness from the sawn edges. The whole tile is tumbled to soften the shape edges created by hand cutting, as well as making the surface look and feel naturally worn. 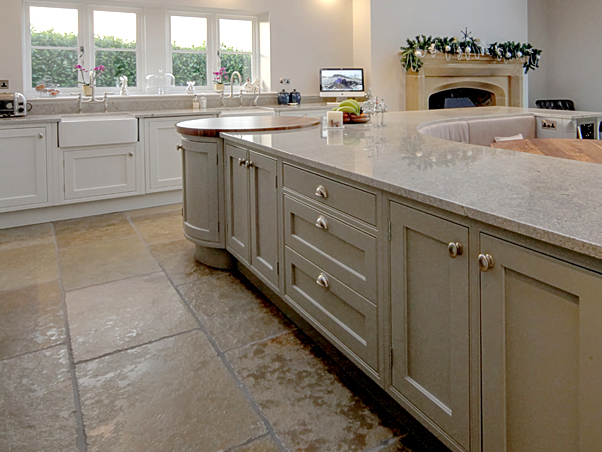 This limestone is very popular for period properties and restoration projects. The perfect limestone floor for barn conversions, cottages, as well as having the added benefit of being suitable for use externally onto a solid substrate. The limestone surface finish is semi-honed to create a level but still lightly textured surface, ideal for non slip. This limestone comes in large format slabs which have been calibrated to 20mm thick for ease of fitting. Each tile is individual, and as the image shows, colours vary through a range of earthy tones. We have the most interest for this stone is from customers looking for a hard wearing, stain resistant floor which appears to be already aged, and looks even better over time!